ABSOLUTE CARNAGE is in our sights -- but Cletus Kasady has some killing to do before the Marvel Comics event begins this August! As Carnage, Kasady has been targeting every person who has hosted a symbiote. 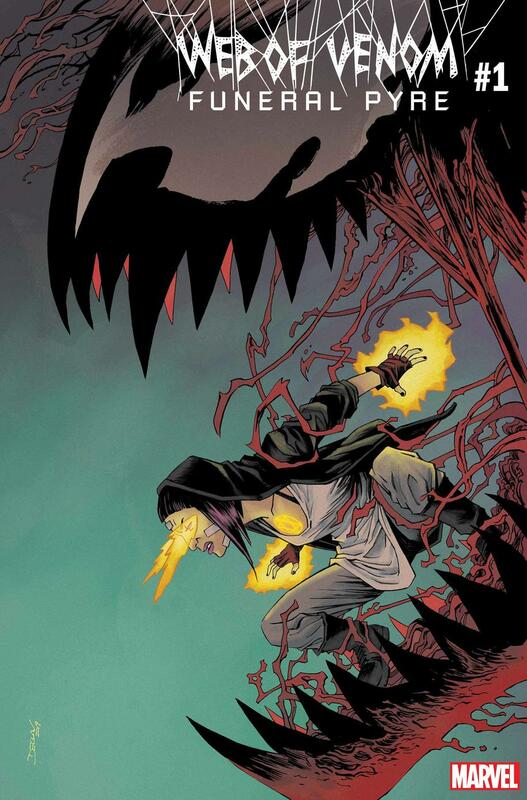 This July, he's going after none other than Andi Benton, former host of Mania, in WEB OF VENOM: FUNERAL PYRE, a new limited series by writer Cullen Bunn and artists Alberto Albuquerque and Josh Cassares. Bunn, who co-created Andi Benton with Shalvey in the pages of VENOM, told Newsarama that Andi will be stalked by Carnage in her hometown of Philadelphia. And while he said he loves Andi Benton "a great deal," Bunn reminded readers that he never goes easy on his favorite characters. "When I took this project, I warned editorial that it was going to be vicious and bloody and cruel. I’m leaning into Carnage’s horror vibe here. This is absolutely a horror story, with Andi as the hero and Carnage as the unstoppable killer." He also said WEB OF VENOM: FUNERAL PYRE would have "a lot of heart... a lot of fear, a lot of blood, and a lot of action." In other words, a perfect alien appetizer for the feast of ABSOLUTE CARNAGE! Stay tuned to Marvel.com for more news about WEB OF VENOM: FUNERAL PYRE and all upcoming new releases!